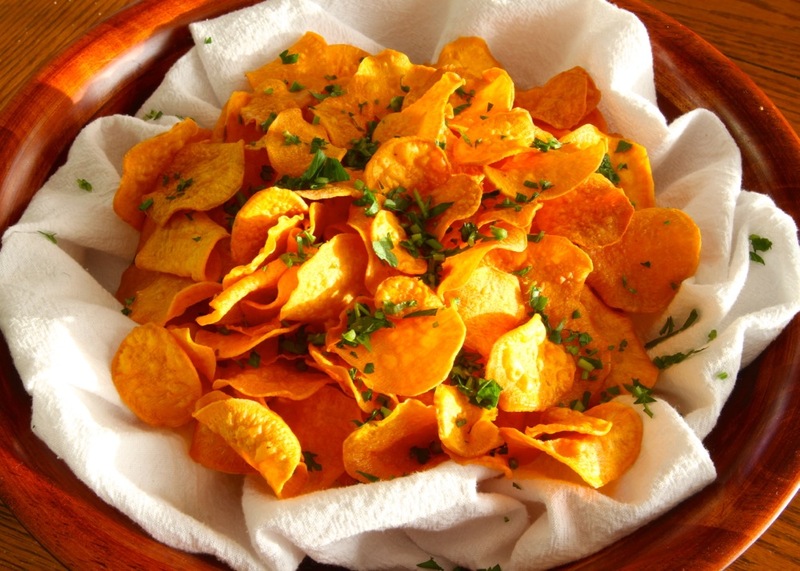 Sweet potato chips are so much tastier than boring old potato chips. And much better looking! The sweet potatoes have to be cut very thinly, with consistent thickness. The best way to do this is with a good mandolin, set to the thinnest setting (on the one I use, it’s 1/32 inch). After slicing, rinse the potatoes in cold water, then dry them thoroughly. It’s very important to make sure they’re dry before frying them. I use a good salad spinner, but paper towels would work too. Small batches. I fry about 20 chips at a time. Too many at once, and it lowers the oil temperature and the chips come out chewy. After frying, place them on paper towels and sprinkle them with sea salt right away. Optionally, garnish with some chopped chives, chervil or parsley for a little added color and flavor. 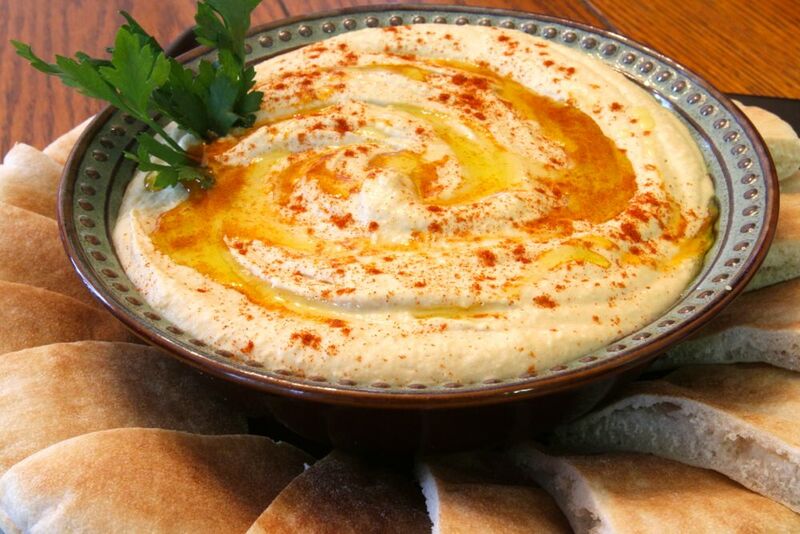 Hummus is another delicious vegetarian recipe that’s super-easy to make. Just mix the ingredients in a food processor and blend until smooth and creamy (about 3 minutes). I have to give credit to my mom for this recipe. She’s been making this for me since I was a small child, and now offers this as one of many delicious vegetarian dishes in her cafe in Woodstock, IL – Expressly Leslie Vegetarian Specialties. This is a modified version of her recipe. If you happen to live in the Woodstock area, stop into her cafe for this and other delicious vegetarian cuisine! 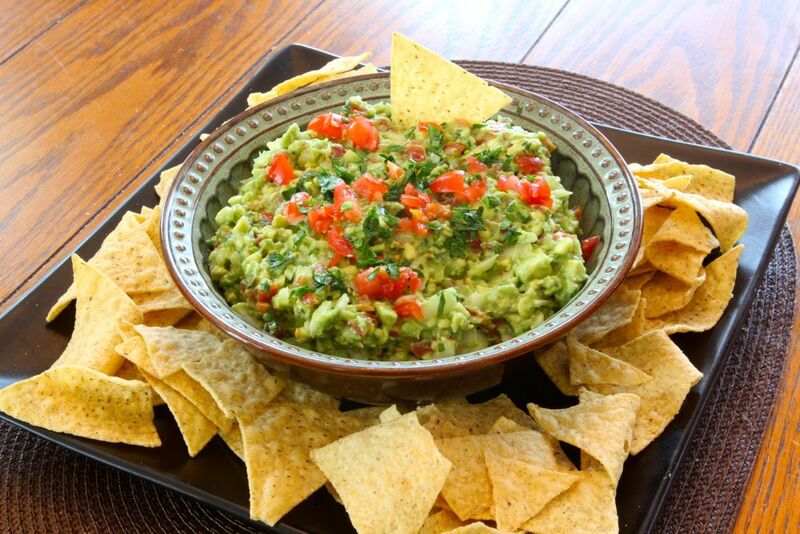 Fresh guacamole is one of my favorite dishes. It’s easy, it takes just minutes to prepare, and it tastes great! Personally, I prefer my guacamole to have a chunkier texture, rather than being mashed as is commonly done. The key difference is that I chop the avocado finely and then stir it gently with the other ingredients, but I don’t mash it all together. Cut avocados in half, peel them, remove the seeds, then chop them into small bits. Place in a bowl. Dip the tomato into boiling water for about 10 seconds. After this, the skin can be peeled off easily. Remove seeds and dice (chop into small pieces). Add to the bowl. Dice the onion, then add to the bowl. Mince the Serrano pepper (make sure it’s minced very finely so nobody bites into a big piece of hot pepper). Measure about 1 1/2 teaspoons (more or less, depending on how spicy you want your guacamole to be), and add to the bowl. Add the chopped cilantro, lemon juice, and salt. Stir everything together gently. Try not to mash it too much – just mix the ingredients. Sprinkle some chopped tomato, onion and cilantro on top as garnish (optional). I suggest serving this right away, when it’s fresh. However, if you need to prepare it ahead of time, cover it with plastic wrap and press down gently so the plastic wrap is in contact with the guacamole. This minimizes the amount of air coming into contact with the guacamole, which will help prevent it from turning brown. Refrigerate until ready to serve.